Self-destruction isn’t a bug, it’s a feature of our socio-economic system. There are culprits aplenty: a “healthcare” (sickcare) system that incentivizes maximizing profits by whatever means are available (for example, claiming addictive medications aren’t addictive); a system that encourages the consumption of costly prescriptive medications without regard to their interactions; a system that establishes a “standard of care” that relies on prescribing pills of one kind or another; a system that treats psychological-physical pain with painkillers rather than treat the source of the pain; a system that cannot recognize spiritual pain (from losing sources of meaning, purpose and positive social roles) much less address it; a workers compensation system that incentivizes vague pain-related injuries as a way of getting a vacation from work; a pharmaceutical industry hard-wired to seek and promote “the next billion-dollar drug” regardless of the long-term consequences of the wonder-drug, and a culture that worships convenience and the illusion that instant remedies to chronic conditions are available or should be available. So if we “reward” doctors for prescribing painkillers and patients for taking them, an opioid epidemic was essentially built into the system by these initial conditions. 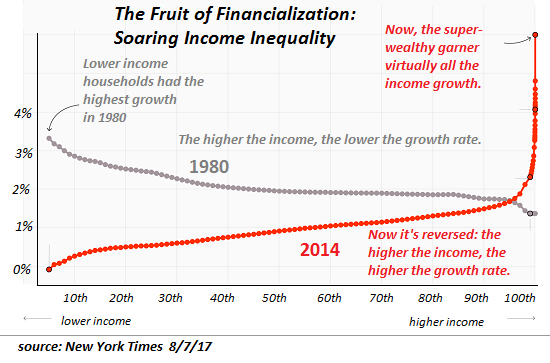 The same can be said of our financialized economic system that rewards speculative gambles backstopped by the central bank or state: once those are the initial conditions of the financial system, it’s literally “crazy” not to borrow billions to gamble or buy back your own corporation’s shares. Then there’s our foreign policy, which is dominated by strange attractors for self-destructive policies such as wars of choice, New Cold Wars, we came, we saw, he died “interventions” and so on. 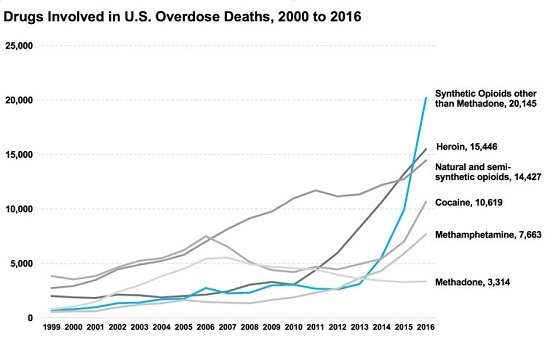 Notice the recent sharp rise in opioid deaths distributed by our “healthcare” system. After the addict has been exploited for profit, heroin becomes the next attractor. 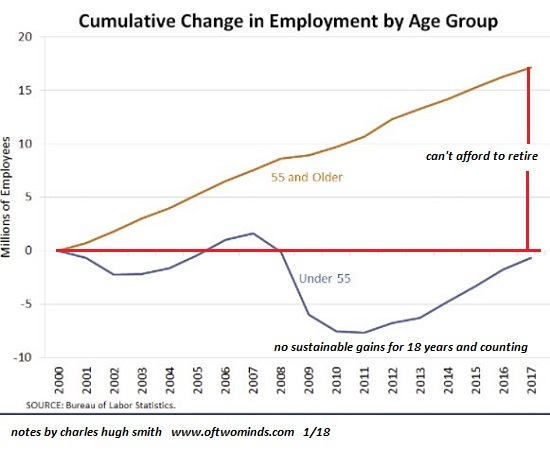 Here’s a chart of employment trends: aging workers can’t afford to retire, while the under-55 work force has been treading water. Might this have some negative effect on the well-being of the populace? 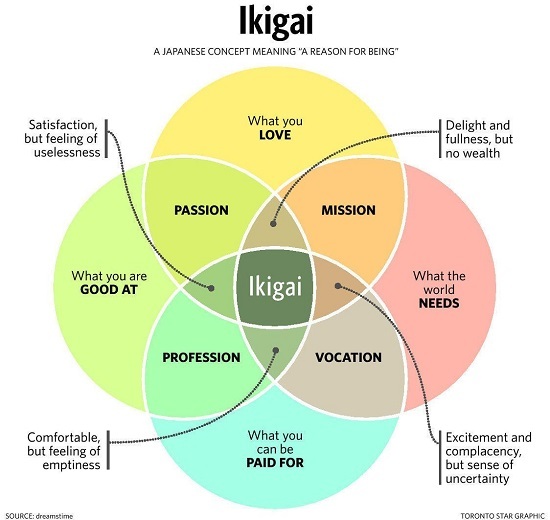 The Japanese term describing a life of meaning, purpose and positive social roles–ikigai— has caught on in certain policy circles. A life of meaning, purpose and positive social roles is the core reason (along with a diet of plant-based real food) that Okinawans are remarkably healthy and long-lived. If you designed a system that had zero incentives via its initial conditions for the nurturing of ikigai, you’d have the status quo. Self-destruction isn’t a bug, it’s a feature of our socio-economic system, built into the system’s initial conditions.